The Samsung CLT-K406S Black Toner allows users to take full advantage of the advanced, easy-to-use features and benefits built into every Samsung printer. Samsung designs and manufactures original color supplies hand-in-hand with Samsung printers to ensure the full spectrum of bright, crisp colors, print quality and reliability that result in real value and savings. It will give your sheets the bright cyan color you want in your various work and photo-related projects, so you can be confident in its performance. The Samsung laser toner will yield 1,000 pages, giving you a lot of usage. It is compatible with CLX-3305FW and CLP-365W printers. The toner has a slim size that is easy to install so you can begin using it right away. CLT-K406S The Samsung CLT-K406S Black Toner allows users to take full advantage of the advanced, easy-to-use features and benefits built into every Samsung printer. Samsung designs and manufactures original color supplies hand-in-hand with Samsung printers to ensure the full spectrum of bright, crisp colors, print quality and reliability that result in real value and savings. It will give your sheets the bright cyan color you want in your various work and photo-related projects, so you can be confident in its performance. The Samsung laser toner will yield 1,000 pages, giving you a lot of usage. It is compatible with CLX-3305FW and CLP-365W printers. The toner has a slim size that is easy to install so you can begin using it right away. 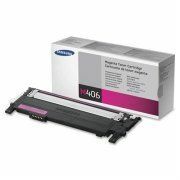 CLT-K406S toner cartridges are a cost effective alternative to buying brand new name brand Samsung toner cartridges. Our compatible toner cartridges are guaranteed to contain as much toner as original toner cartridges. In some cases we actually add more toner for increased lifespan! CLT-K406S toner cartridges are manufactured under strict ISO-9001 standards using only the highest quality inputs in order to achieve the highest quality remanufactured toner cartridge. Our CLT-K406S and other ink cartridges & toner cartridges include free shipping on orders over $49 and are covered by our standard 1 year defective product warranty. To Recieve updates and possible rewards for Samsung CLT-K406S Black Toner please sign in. To Recieve updates and possible rewards for Printer Cartridge, Ink & Toner please sign in.